This year, you could be sitting on a beach, skiing down a mountain, or taking in the sites in Europe. All you have to do is write Phoenix Safe Harbor Term cases and have the policies issued! 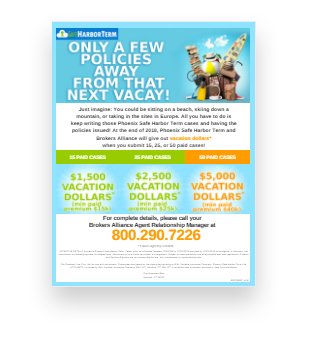 At the end of 2018, Phoenix Safe Harbor Term and Brokers Alliance will give out vacation dollars* when you submit 15, 25, or 50 paid cases! INCENTIVE DETAILS Applies to Phoenix Safe Harbor Term. Cases must be submitted between 3/15/2018 to 12/31/2018 and paid by 12/31/2018 to be eligible. In the event that commission on a qualifying case is charged back, the contest prize will also be subject to chargeback. Subject to state availability and all applicable laws and regulations. Phoenix and Saybrus Partners are not responsible for late, lost, misdirected, or incomplete applications. For Producer Use Only. Not for use with consumers. Guarantees are based on the claims-paying ability of PHL Variable Insurance Company. Phoenix Safe Harbor Term Life (ICC14PPTL) is issued by PHL Variable Insurance Company (PHLVIC), Hartford, CT. PHLVIC is not authorized to conduct business in New York and Maine.